Never in my life did I imagine a Christmas card with a Basic Black, Very Vanilla and Gold colour combo! I absolutely LOVE it! The Winter Wonderland Designer Series Vellum Stack is breathtakingly beautiful! At first I used up all the Gold foiled vellum in the stack - I was to scared to try the Black! I can now say that I used quite a bit of the Black foiled sheets and is just something about this Vellum Stack.... The musical note sheet from the Home For Christmas Designer Series paper worked very well with it, I think. My strips for the rosette measured 30.5cm x 4cm and I scored every 1cm lengthwise (using the Metric Scoring Plate with my Simply Scored scoring tool. I found that a hot glue gun works best to glue the rosette into shape. Let me know what you think - I would love to hear from you! Such beautiful layering! The stitching on this card adds a wonderful accent to the already-beautiful vellum. The snowflake on the doily on the rosette of DSP...exquisite! Thank you for playing along with this week's sketch challenge for the Global Design Project! I admire anyone that will add stitching to their projects! What a great way to represent the four panels in the GDP sketch. You have created a lovely project! Thanks for playing with us at Global Design Project this week. Thanks Paula! I keep my sewing machine handy for my cards, the moment fabric comes into the picture I cannot do a thing! Melodie, this is a stunning card with a beautiful focal point. I am crazy about rosettes! 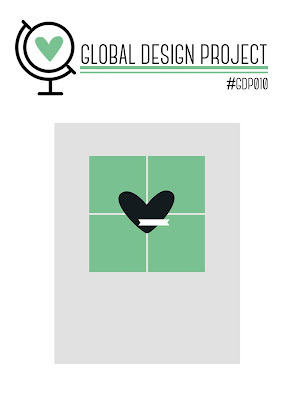 Thanks for joining us this week at Global Design Project. Such lovely dimension and wonderful way to use the sketch. I can't get enough of the stitching. Thanks or playing with Global Design Project.